1284026981 -Through a clear, concise presentation, this text will assist fire investigators in conducting complex fire investigations. 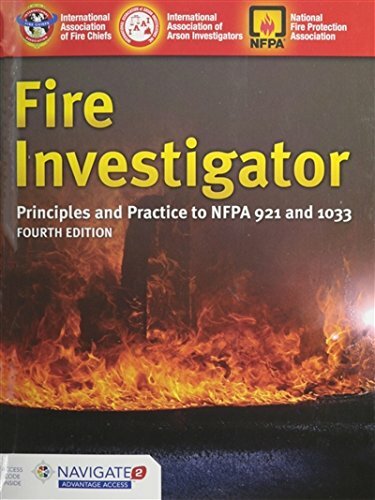 Written by talented professional fire investigators from the International Association of Arson Investigators (IAAI), this text covers the entire span of the 2014 Edition of NFPA 921, Guide for Fire and Explosion Investigations and addresses all of the job performance requirements in the 2014 Edition of NFPA 1033, Standard for Professional Qualifications for Fire Investigator. This text is the benchmark for conducting safe and systematic investigations. Fire Investigator: Principles and Practice to NFPA 921 and 1033 is also appropriate for use in the Fire and Emergency Services in Higher Education’s (FESHE) Fire Investigation I and Fire Investigation II model courses.